UNITED STATES DISTRICT COURT FOR THE SOUTHERN DISTRICT OF TEXAS McALLEN DIVISION AMALIA RAMIREZ CASTELANO, Case No. CA M-08057 SOFIA ELIZABETH LOPEZ, and J.S. a minor by and through his next friend (Class Action) Sonia Raquel Cantu-Sanchez, on their own behalf, and on behalf of all others similarly situated, PLAINTIFFS-PETITIONERS, v. HILLARY RODHAM CLINTON, Secretary of State, PATRICK F. KENNEDY, Under Secretary for Management, JANICE JACOBS, Assistant Secretary of State for Consular Affairs, FLORENCE FULTZ, Managing Director, Passport Services Directorate, and UNITED STATES OF AMERICA, DEFENDANTS-RESPONDENTS. 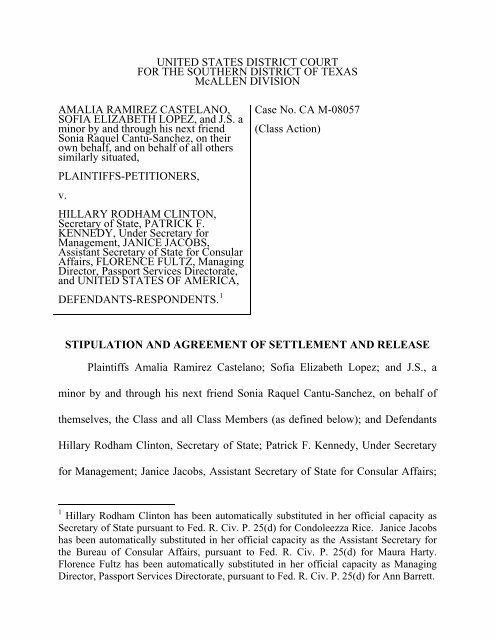 1 STIPULATION AND AGREEMENT OF SETTLEMENT AND RELEASE Plaintiffs Amalia Ramirez Castelano; Sofia Elizabeth Lopez; and J.S., a minor by and through his next friend Sonia Raquel Cantu-Sanchez, on behalf of themselves, the Class and all Class Members (as defined below); and Defendants Hillary Rodham Clinton, Secretary of State; Patrick F. Kennedy, Under Secretary for Management; Janice Jacobs, Assistant Secretary of State for Consular Affairs; 1 Hillary Rodham Clinton has been automatically substituted in her official capacity as Secretary of State pursuant to Fed. R. Civ. P. 25(d) for Condoleezza Rice.  Janice Jacobs has been automatically substituted in her official capacity as the Assistant Secretary for the Bureau of Consular Affairs, pursuant to Fed. R. Civ. P. 25(d) for Maura Harty. Florence Fultz has been automatically substituted in her official capacity as Managing Director, Passport Services Directorate, pursuant to Fed. R. Civ. P. 25(d) for Ann Barrett.